The Karen National Union’s Agriculture Department will give priority to assist the public in obtaining their land ownership rights and solve land issues that rose up in the mixed controlled areas within this year. The department made the decision during its 12th year-end meeting held at Kalo Yaw Hta under Hpa-an District on May 30. Local residents from the KNU-controlled areas have been demanding the KNU to do required land measurements in order to obtain land grants. Padoh Saw Lay Say, secretary of the KNU’s Agriculture Department, said confrontations may arise between the government and the KNU over the land issues in areas of dual administrations between the government and the KNU. “We will continue to prioritize land measurements in accordance with the work program set down by respective central districts. Land issues have risen now in some mixed areas. The ward and village administrators and township land records department have been working together in selling off public lands,” Padoh Saw Lay Say told Karen News. Most of the land issues occur in the KNU’s Hpa-an, Doopalaya, and Thaton districts and land disputes are taking place between the local residents due to the land measurements carried out the government. When the department tried to solve the issues, they were told that the government was following the order from above. 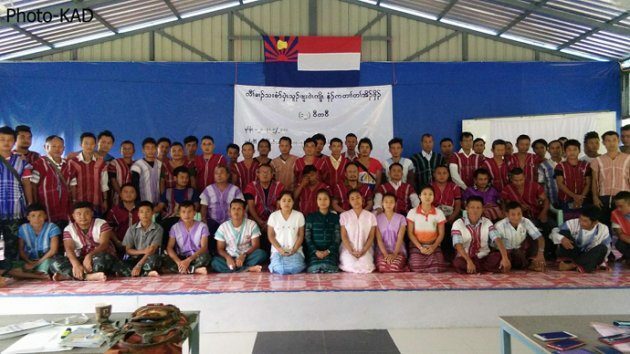 Over 80 people including officials from the KNU Central Agriculture Department, agricultural department heads from seven districts, secretaries, central committee members, and experts attended the annual meeting, which was held on May 28-30, and discussed the activities they have carried out within 2017 and early 2018 and the agricultural policies, which are still being implemented. As one of the 14 departments under the KNU, the Agriculture Department was established in 1949 and the land policy was enacted in 1974. The land policy was amended in 2005 under the slogan “The Land is for the Local People”. The existing land policy was amended for modern times in December 2014 under the slogan “Land is for the sake of the local people”, according to the KNU. Since 2013, the KNU’s Agriculture Department has been carrying out land registrations and measurements in the Karen State and other Karen areas within its reach.